Through the performing arts, Voices in the Treetops strives to develop integrity of character and foster positive, productive self-discipline. We concentrate on arts programs for children, teens, and adults which promote social and environmental responsibility, wellness, entrepreneurial skills development, social justice, and cultural preservation. We teach the principles of peacebuilding communication, using the power of music, song, and story circles to facilitate constructive dialogue and collaboration between community service agencies, artists, individual community advocates, health professionals and educators. A veteran of the professional stage, (New York Shakespeare Festival, New Federal Theatre, La Mama) Paula Larke utilizes her music, poetry, and stories of real life heroes and �she-roes� as a modern day �djali�, or historical chronicler. She teaches essential lessons of peacemaking: integrity, fortitude, hope, and healing. She has over thirty years experience in promoting literacy, eradicating intolerance, teaching African and American history, and encouraging ethical consciousness and behavior for individuals and organizations. Her accolades as a performer/lecturer include enthusiastic endorsements from the North Carolina Department of Juvenile Services, Leadership America, the General Board of Global Ministries, and innumerable advocacy organizations across the U.S. In addition, she provides counseling and motivational workshops through faith-based and community service organizations across the country. She works with refugees from every continent to help them acclimate to American language and customs and still honor the traditions and values of their own cultures. Unceasingly promoting peace, justice, and integrity, Paula is a treasured advocate and mentor, combining her musical and theatrical artistry with skills learned in her training with CTI (CONNECT Training Institute), Creating a Culture of Peace, The Children�s Creative Response to Conflict, Inc., and the Brecht Forum TOP Lab (Theatre of the Oppressed), as well as two decades of community organizing and education training through work within cutting edge programs with Carpetbag Theatre, Inc., ( Kellogg Foundation, Brushy Fork Institute,) the Mary Reynolds Babcock Foundation, Southern Rural Black Women�s Development Initiative, the Highlander Center in New Market Tennessee, among many others. Within her organization, VOICES IN THE TREETOPS, Inc., Paula follows a family tradition - mentoring other artists in the integration of arts and social justice activism. 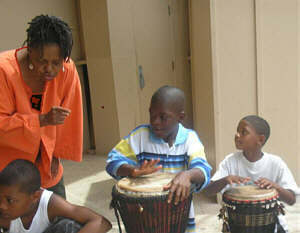 TREETOPS� mission is to give on-the-job training to elder and young artists alike. She translates issues, goals, messages, etc. into singing, dancing, story-telling, acting, or Image Theatre to enhance, energize, and unite divided or competing individuals, institutions and community service agencies. Through her talents as a multi-disciplinary artist Paula brings heightened consciousness, joy, motivation and healing to minds and hearts across the nation. She is a member of Alternate ROOTS, Inc., and of Actors Equity Association.